With any home project, purchase, or even hobby, it’s wise to consider the return on investment. Sure, that dress costs $200, but it’s a staple you’ll wear often at work. Your membership to the gym is expensive, but it’s worth it for your health. Your home itself was an investment — and you’re hoping the ROI will pay off years down the road when you sell. The same can be said of foundation repair. There are many reasons people attempt to procrastinate foundation repair — and it never ends up working out for them. They, eventually, contact foundation contractors and pay the bill they were so afraid of — but the bill is most likely higher because they waited. 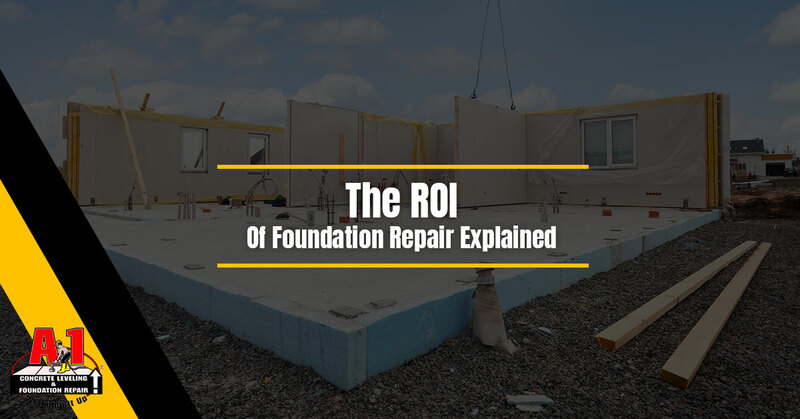 The ROI of foundation repair is well worth the cost, and in today’s blog, we’re going to explain why. If you’re in need of foundation contractors or foundation repair in Nashville, contact A-1 Concrete Leveling and Foundation Repair today to get started with a free quote. Delaying foundation repair initially because of the cost or your schedule could lead to more problems later on, which could ultimately cost more or affect your schedule even more drastically. It’s not just about current foundation problems worsening, though. It’s also important to consider that current problems could lead to other problems that never would’ve occurred if repair had happened sooner. Being able to tell future buyers that the basement is waterproofed or that foundation problems were recently repaired — and being able to prove this with paperwork — means you can most likely have a higher asking price for your home and get that ROI you were originally looking for. 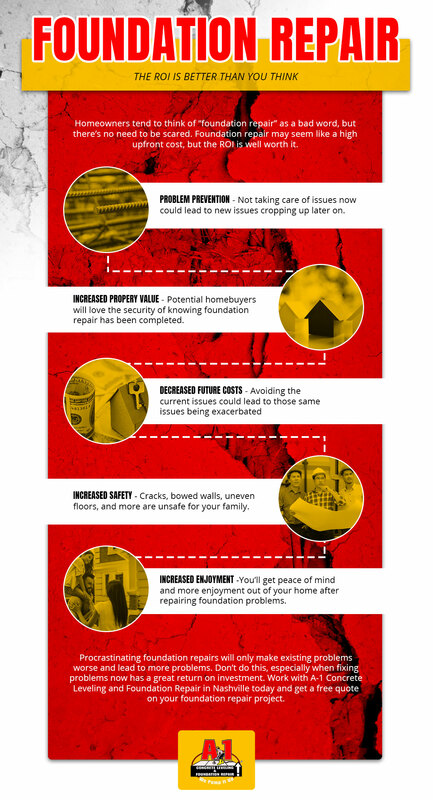 The cost of fixing that leaky basement or foundation crack may not be too drastically expensive upfront, but it certainly will be months or even years down the road if you don’t address the problem as soon as you see signs of needing foundation repair. Foundation cracks, wet basements, uneven floors, and more can lead to greater risks and dangers for your family. Whether it’s you looking down at your phone and tripping on a crack while walking or your child riding a bike and crashing because of a large crack, there are a lot of potential threats. You’ll have peace of mind and enjoyment — and what’s a better ROI than that? By having your floors even, your doors not jamming (a common symptom of needing foundation repair), and cracks fixed, you’ll be amazed at just how much more enjoyable your home will become. What are you waiting for? You can increase your property value, safety, and enjoyment by finally getting around to foundation repair. Contact our foundation repair company in Nashville today to get started with a free quote from our professional foundation contractors. We work with clients throughout the area, including Goodlettsville, Murfreesboro, Columbia, and Burns.